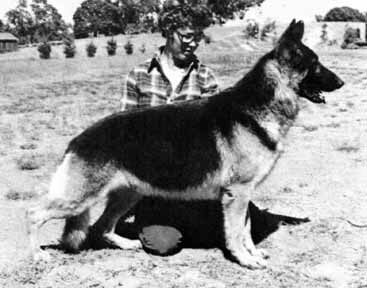 Ch Von Sudies Annie Laurie, C.D.X. "Zinfandel is a lush coated, richly pigmented, medium to large size, high withered dog. He is brilliant and has the character, strong and fearless, that is suitable for working in Obedience, Schutzhund or Police work. His offspring have passed as Guide dogs for the blind, and because of his outstanding disposition and ability to reproduce it, Zinfandel was used just on these merits along. He has improved temperaments and intelligence more than any other stud dog we know of in this country."